Thank you for ordering tickets. You will need to click "Add to Bag'' for each ticket you purchase (the "Bag" is often in the bottom right corner of the page, especially on mobile devices). You can select the section and row but you cannot select the exact seat but you can request it in the row box. 1. Scroll down and click "Add to Bag" under the ticket of your choice. 2. Select the type of ticket, quantity, and delivery method. • Note any seating preference. • Click 'Add to Shopping Bag' button. • To purchase additional tickets of a different type, use the 'Continue Shopping' button on the next page to return to this page and add other tickets to your cart. 3. Please enter your e-mail address when placing your order so we may send you confirmation. It will not be disclosed to any other organization or person. 4. A small handling fee, approximately 2-4% of the purchase price, is included to cover the cost of our credit card processing. 5. Tickets ordered within one week of each concert cannot be mailed. They will be held for you to pick up at Will Call. We will confirm your order by e-mail. It is always a good idea to bring your receipt with you to claim Will Call. 6. You may purchase tickets using either a credit card or a PayPal account. If you have a discount code, please enter it in the checkout screen. 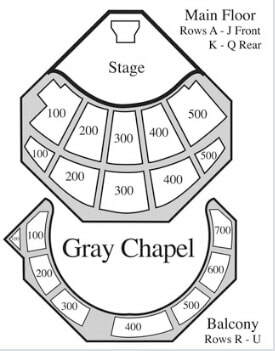 Click here for stage views from each section of Gray Chapel. We will assign the best available seat(s) closest to your selection. The balcony is NOT handicap accessible. Please note: Artists and program are subject to change. Unfortunately, we cannot offer refunds based on these changes.